Dare to face an uncompromising look at the real need in modern western Christianity; something far more important than methods, structures, or gimmicks--ethos. Once you build a biblical ethos into your group they will handle any obstacle and continue to thrive. The Lord will encourage you that New Testament church is possible, and He'll give you biblical and practical ideas for building a biblical ethos into your church. Members of One Another, is not a pharisaical firebomb being thrown at the church. It reflects a pastor's heart that doesn't want to beat up the church, but rather, wants to see the church built up. As a pastor, I was both challenged and convicted. This is a must read for the church and for every church leader. "I've been losing sleep because of this book!" Dare to face an uncompromising look at the real need in modern western Christianity. Does a church's strength come from a stage, or from its members? 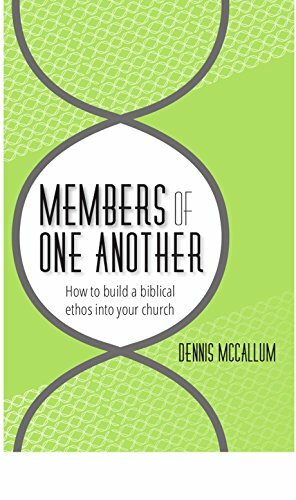 In this training manual for church leaders, McCallum discusses something far more important for local churches than methods, structures, or gimmicks: "ethos." If you can build a biblical ethos into your group they will be ready to handle any obstacle and continue to thrive, regardless of your church model. Dennis McCallum has been lead pastor of Xenos Christian Fellowship in Columbus, Ohio for forty years. During that time, Xenos has grown from a single Bible study to hundreds of house churches through natural friendship evangelism, the cultivation of body life, and personal discipleship. Dennis is the author of a number of books, including Organic Disciplemaking and Satan and his Kingdom. He and his wife, Holly serve in Xenos along with their three grown children and their families.